We’re continually working to make SkyDrive the best way to always have your files with you, and one of the key areas we’re focused on is photos: relative to other file types, they take up the largest amount of space and people interact with them the most. 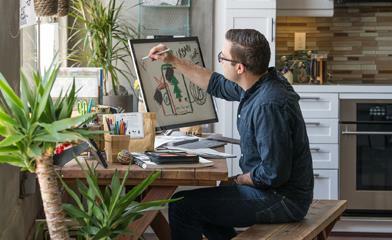 We recently released a number of features that enhance the SkyDrive photo experience – from better visual design to easier searching and sharing across your devices. We’ve also continued to improve performance for the photos experience. Today, in partnership with the Bing team, we’re excited to release the first of several features that will make your SkyDrive photos smarter by using OCR (optical character recognition) to extract the text from photos in your camera roll when you view them on SkyDrive.com. Most of us can think of a time that we took a picture of something that we really just wanted the text from. It could have been a photo of a product label at a store, a picture of a magazine article or ad, or a snapshot of a sign with info you wanted to remember. When you take photos with your Windows Phone (with auto-upload turned on) today, we send them to your SkyDrive camera roll folder. With this new SkyDrive release, our OCR tool will automatically run on your camera roll photos so you can instantly see the extracted text whenever you view your photos on SkyDrive.com. 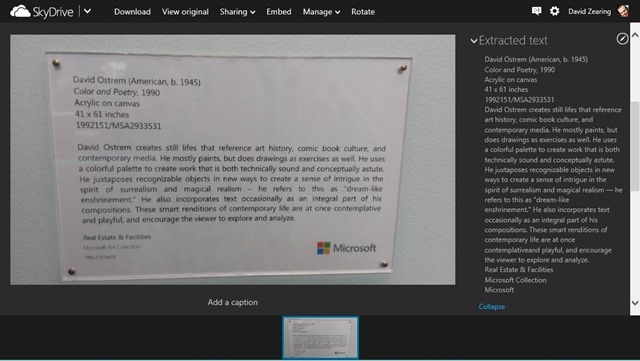 For example, here’s a photo of an artwork label, with the text extracted and shown in the Properties pane. This feature is available in English, Portuguese, Spanish, French, and German. It might take a day or two to roll this out to everyone, so if you don’t see it on your SkyDrive yet, you should see it soon. We hope that you enjoy this new feature of SkyDrive, and that it makes browsing your photos on SkyDrive.com a smarter and more efficient experience. We’re looking forward to continuing to build on this capability in future releases. We hope you’ll give it a try now, let us know what you think, and what you’d like to see us add next. Note: This blog post was updated after publication.